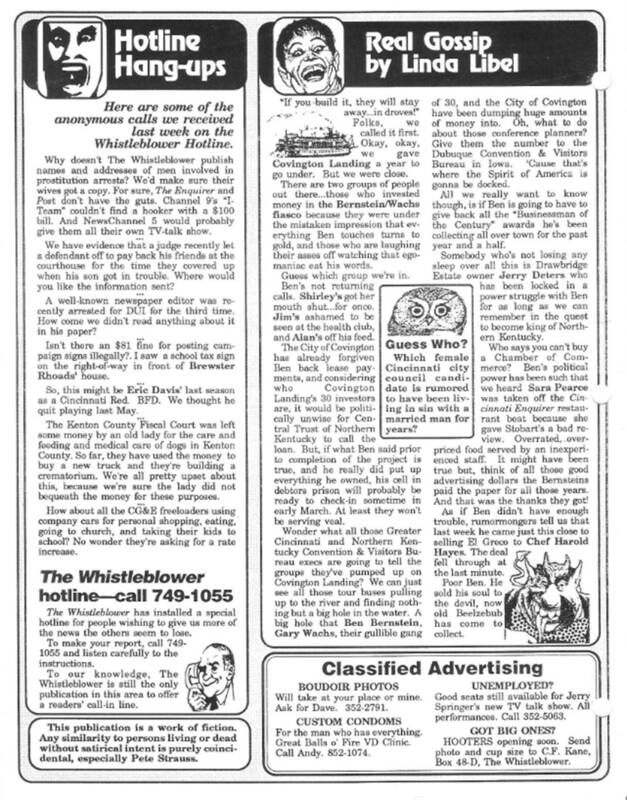 Edition #71 (published on October 8, 1991) of the original printed edition of The Whistleblower (not the Newswire) was delivered to Persons of Consequence all over town. 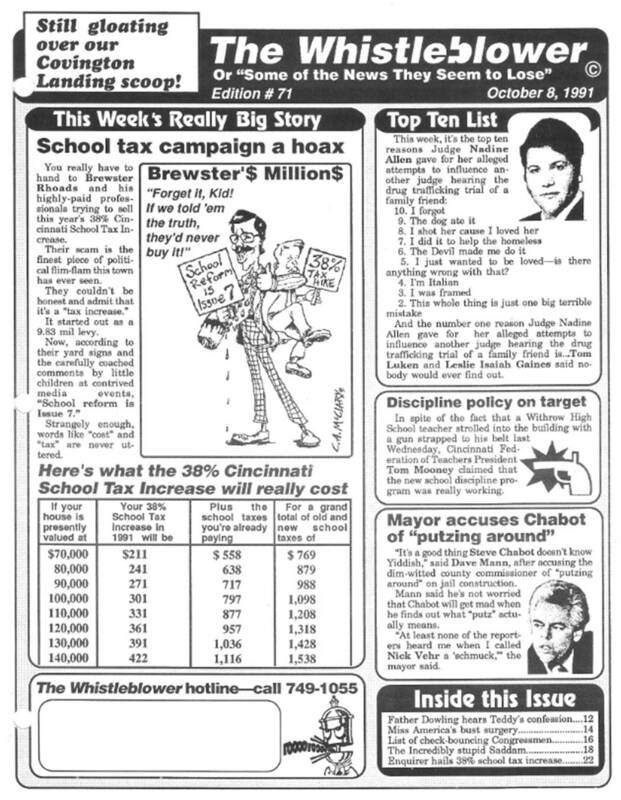 It was our “Still gloating over our Covington Landing scoop!” Edition, and our REALLY BIG STORY on the Front Page was all about Brewster Rhoads 38% School Tax Hike being a hoax. Our TOP TEN LIST listed was the top ten reason Judge Nadine Allen gave for her alleged attempts to influence another judge hearing the drug trafficking case of a family friend. Cincinnati Federation of Schools President Tom Mooney claimed the new school discipline policy at Withrow was really working, Cincinnati Mayor David Mann accused Hamilton County Commissioner Steve Chabot of “putzing around” on jail construction. 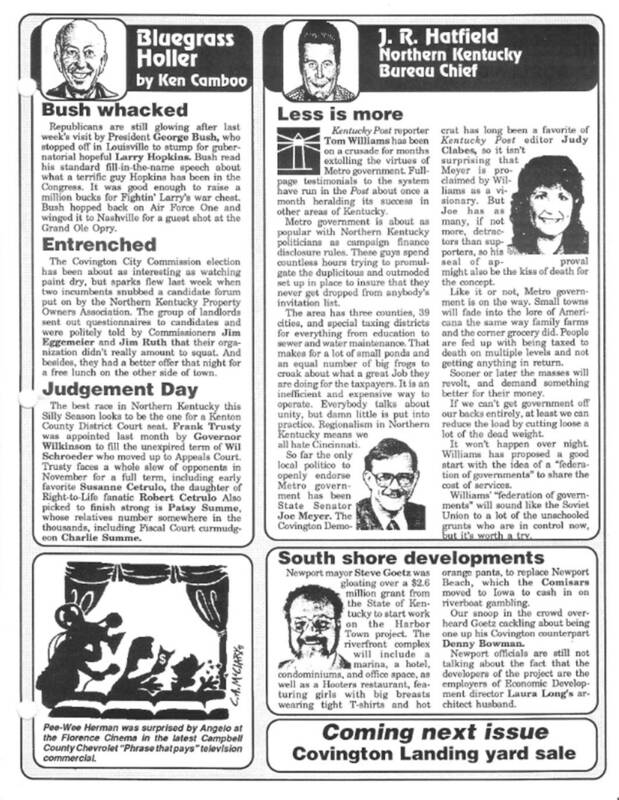 PAGE TWO featured another REAL EDITORIAL BY PUBLISHER CHARLES FOSTER KANE talking about how too many people were taking some of the Whistleblower’s jokes seriously. 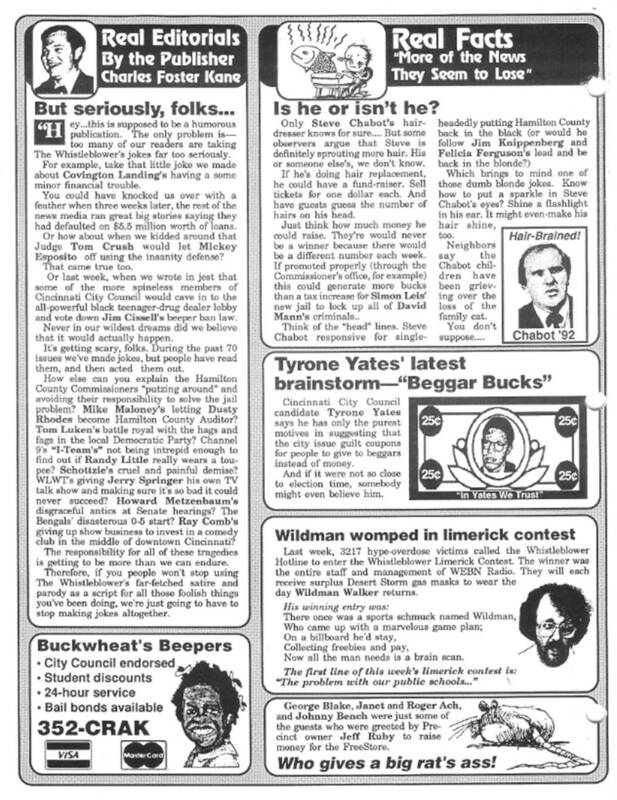 REAL FACTS told about the controversy over Steve Chabot’s hair replacement, Cincinnati City Council Candidate Tyrone Yates came up with the idea of “Beggar Bucks,” and Wildman Walker was womped in the WEEKLY WHISTLEBLOWER LIMERICK CONTEST. PAGE THREE featured CHEAP SHOTS taken at CAC Director Dennis Barrie, lovely and talented Retail columnist at the Cincinnati Post Jennifer Kent, City Council Candidate Jay Andress, and school tax foe Blake Baird. There was the usual promo for Whistleblower Publisher Charles Foster Kane’s appearance on a local radio talk show, and Bunky Tadwell complained about trashing Christopher Columbus in ANOTHER GUEST EDITORIAL. 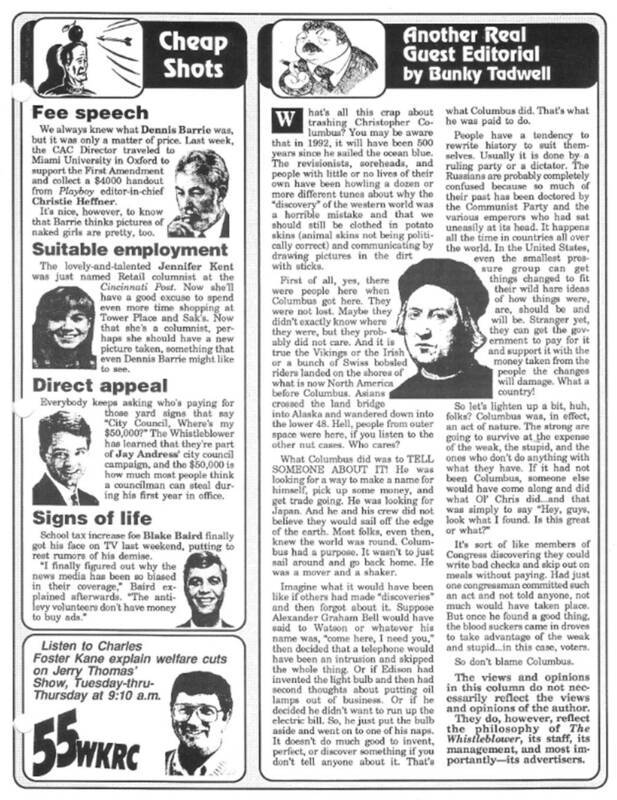 PAGE FOUR featured the REAL LETTERS FROM REAL SUBSCRIBERS, and during all those years, not a single one of those people has ever called to complain that their letter might not have been real. In ANOTHER EXCLUSIVE WHISTLEBLOWER REPORT, we reported how the Hamilton County GOP was ignoring suburban candidates, probably because none of them was named Deters. Tor Johnson was our UNITED APPALL PERSON OF THE WEEK. Plus there was an ad for the 38% School Tax Levy Increase, paid for by Citizens for a Mediocre Education. 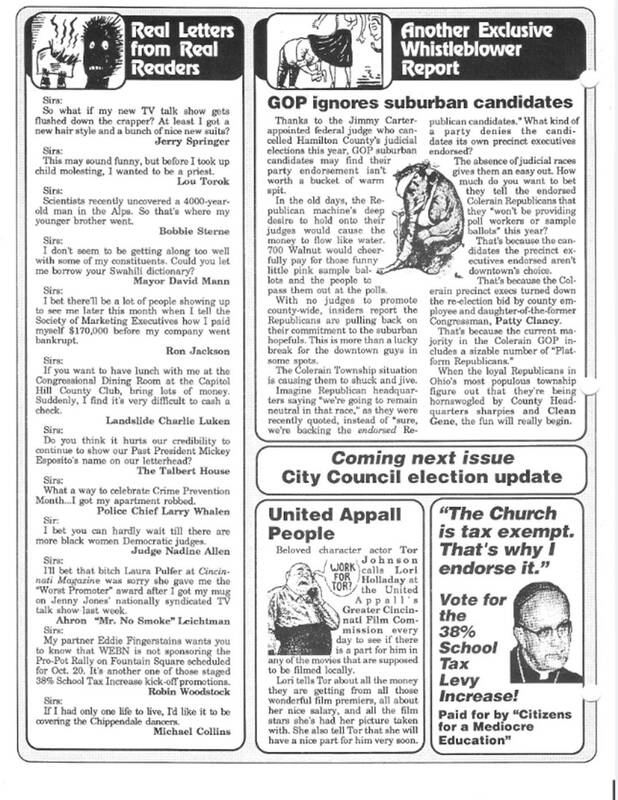 PAGE FIVE featured Ken Camboo’s BLUEGRASS HOLLER, reporting about President Bush’s campaign stop for gubernatorial hopeful Larry Hopkins, Covington City Commission Candidates snubbing a forum put on by the Northern Kentucky Property Owners Association, along with the silly season campaigning for a Kenton County District Court seat. Northern Kentucky Bureau Chief J. R. Hatfield’s “Less Is More” column covered all those people predicting Metro government was on the way and Newport Mayor Steve Goetz was gloating over a $2.6 million grant for the Harbor Town Project. And PAGE SIX included HOTLINE HANG-UPS, with some of the anonymous calls we received last week on the Whistleblower Hotline. And right before those FAKE CLASSIFIED ADS, and Whistleblower Gossip Columnist Linda Libel couldn’t stop gloating about her Covington Landing scoop, along with some really great Classified Ads. This was one of our best all time e-ditions. This entry was posted in Uncategorized and tagged Brewster Rhoads, CAC Director Dennis Barrie, Citizens for a Mediocre Education, Covington Landing, David Mann, Larry Hopkins, Northern Kentucky Property Owners Association, Steve Chabot’s hair replacement, Steve Goetz, Tor Johnson, Tyrone Yates, Wildman Walker on October 3, 2018 by charlesfosterkane.